STOCKSCH 100 - Botany for Gardeners ONLINE Summer and January terms (GenEd BS). I take a holistic view of plants including ecology, plant form and function, inheritance and evolution, and the relationship between plant life and human life. The class is taught using world food, agricultural and gardening examples as much as possible. 4 credits. To register for this class see the UMass Amherst Continuing and Professional Education. STOCKSCH 118 - Introduction to Sustainable Food and Farming FALL and SPRING - 1 credit; pass/fail. This seminar is a participatory introduction to the field of Sustainable Food and Farming focused on academic preparation and possible internships and careers. Open to all SFF majors. Others interested in the field may request permission to join the class depending on space. STOCKSCH 379 - Agricultural Systems Thinking - FALL This course will provide students with an opportunity to learn and practice systems thinking to deepen their understanding of complex food and farming systems and integrate the learning acquired from discipline-focused courses. Satisfies the Integrated Experience (IE) requirement for Sustainable Food and Farming majors. Three credits. STOCKSCH 382 Writing for Sustainability Spring semester. Satisfies Junior Writing requirement for PSIS students. See the syllabus here. 3 credits. Prerequisite; STOCKSCH 265 Sustainable Agriculture. STOCKSCH 485 Capstone in Sustainable Food and Farming - This course introduces students to the process of developing a research project, an educational project, or a public policy/advocacy project in the area of sustainable food and farming. The result will be a poster that provides a culminating experience for seniors and a presentation at the Massachusetts Undergraduate Research Conference. 3 credits. Prerequisite; STOCKSCH 265 Sustainable Agriculture and STOCKSCH 382 Writing for Sustainability or permission. John currently teaches courses relating to sustainability at the University of Massachusetts where he provides leadership for the undergraduate program in Sustainable Food and Farming. He continues to investigate ways in which students are encouraged to explore personal growth and community responsibility through service, dialogue, and contemplation. His greatest professional joy is to watch young people find their calling (especially when it relates to local food and farming). 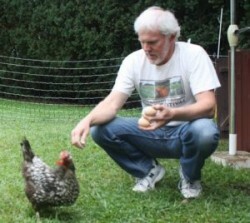 He was instrumental in helping to initiate student projects at UMass such as the Permaculture Initiative, the Student Farm, GardenShare, and the Real Food Challenge. He received the highest honor awarded a teacher at UMass in 2008 with the University Distinguished Teacher Award.